Head over to the App Store for iOS, or Windows Store for Windows Phone. For Android, you can update your app from Android Play. 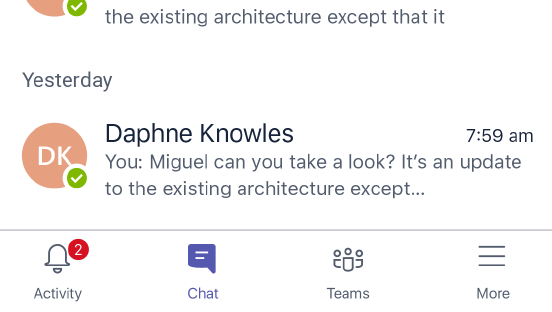 T-Bot is here to help you learn how to use Microsoft Teams! Ask a question or type a keyword or phrase into the chat, and we’ll find the answer. Got a suggestion? We’d love to hear it. Whenever you’re in the mobile app, you can access the Feedback page by shaking your phone (no, really, shake it). 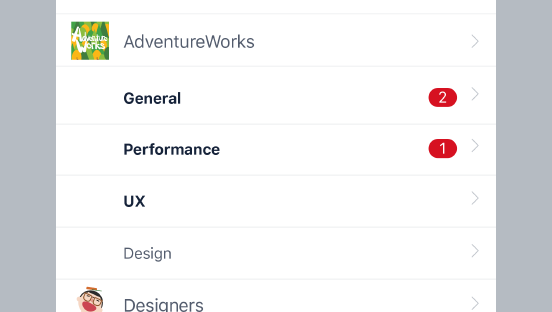 From there, you can report a problem, request a feature, send feedback, and attach screen shots! How do I send emoji or GIFs? Tap to start sending GIFs and emoji! If you’re working with iOS, you can send emoji from your Giphy app; or you can send a GIF just by coping it from the Giphy app and pasting it into a conversation. On an Android phone, you can send a GIF just like you can in the desktop or web app. Tap and then to add some levity to your worklife. Teams are groups of people working together on different projects. 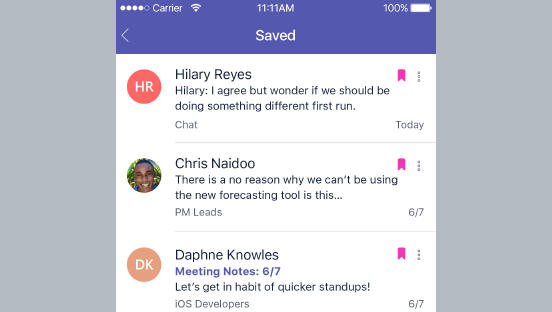 Channels are like chatrooms for your entire team. Organize your channels by topic, location, project, or discipline. Want to add someone to a channel? It's easy; you don't even need to send an invite. Whenever you invite someone to join a team, they gain immediate access to all team channels. That way, they can join any channel they like, anytime! How do I let people know I created a channel? To let someone know you’ve created a channel, just @mention them within the channel and they’ll get a notification. How do I let people know I created a new team? To let someone know you’ve created a new team, just @mention the team name in your General channel! Every team member will get a notification. Team owners have to enable @team mentions. How do I manage and organize my teams? The mobile app will automatically show you all the teams you’ve been invited to join. Even more actions are available in the desktop or web app. How do I get someone's attention? The best way to make sure people see your message is to @mention them. Just type @ before a name and choose the person you want to mention from the picker. They'll get a notification and a number will appear next to the channel you mentioned them in. To @mention someone on iOS or Android, just tap @ in the compose box or type @ before someone's name. On Windows Phone, just type @ before someone’s name to get their attention in a conversation. How do I see all the channels in a team? To see a complete list of all the channels in a team, just tap the team name. How do I see who's in a channel? You can view the member lists for each channel on Android devices, if you tap the team name then at the top right. What does it mean to be mentioned or @mentioned? If you're @mentioned, it means someone wants to include you in a conversation or get your attention. If you type a @ before someone’s name, they’ll be @mentioned (and notified). Don’t worry, no one else will receive a notification. They will be able to see that you @mentioned someone, though. Where do I find more information about a teammate? 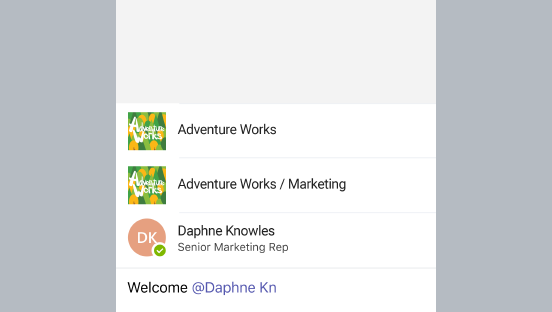 Android: In a channel or chat, just tap someone's avatar to see their contact card. 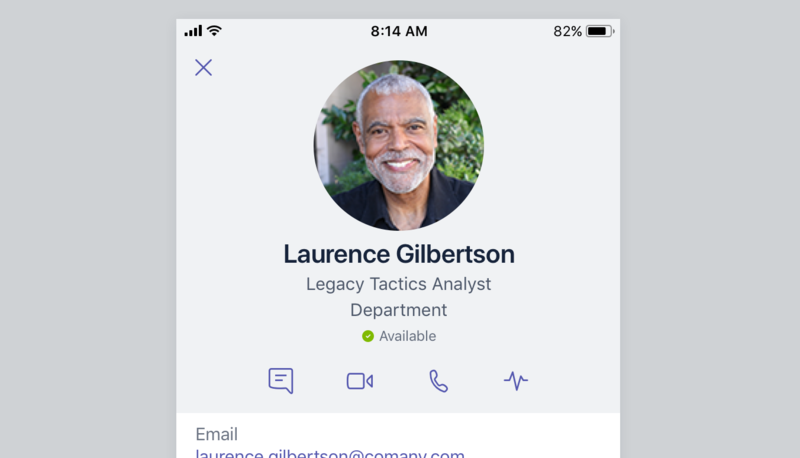 iOS: In a channel, tap someone's avatar to see their contact card. From your chat list, tap their avatar and then tap their name at the top of your conversation. To change your status, just tap the More button. Then, tap Status (below your picture) to view your options. Can I list my favorite chats, teams, and channels at the top of each list? You can reorder your teams so your favorites live at the top right from your desktop or web app. Any changes you make will be reflected on your mobile device. What is a team meeting? Team meetings are an easy way for people in a conversation to host an impromptu meeting. They include audio, video, and screen sharing. Team meetings all take place in the desktop or web app. To get more info about how to start or join a meeting, check this out: Meetings and Calling. How do I know if a team meeting is going on? 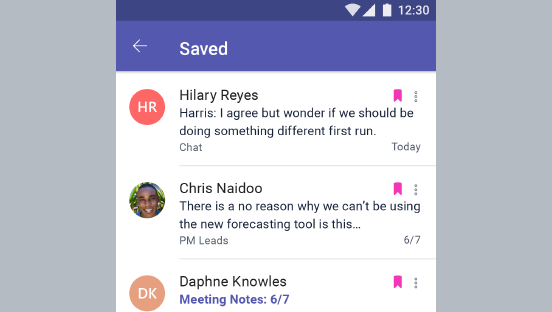 You'll see a message in a channel conversation anytime a meeting has started. You can join the meeting from the desktop or web app. How do I copy and paste inline? To copy the text from a sent message, tap and then Copy. Otherwise, when you’re in the compose box, it’s business as usual! Tap and hold to select/ copy text and then paste. 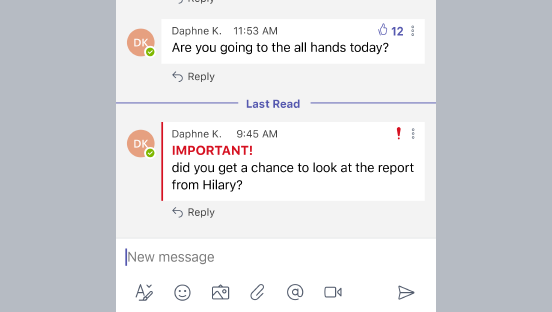 How do I mark a message as important? Want to be sure your message gets noticed? Mark it as important! For iOS and Android, expand your compose box by tapping , and then tap to highlight the message in the chat. This will also send a notification to everyone in that channel. Feel like doing some formatting? For iOS and Android only, click in your compose box to open the text editor. The editor lets you underline, italicize, or bold text. 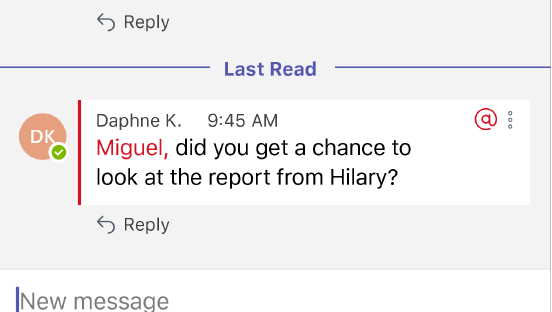 You can start new paragraphs (without accidentally hitting send), highlight text, or even switch to red text. To save any message in a channel, just click to the right of the message you want to save. You can find your saved messages in the More view by tapping Saved. What happened to my old conversations? Old conversations will not appear in your chat list if they haven’t been active for the past 2 weeks. We’ll always keep at least 10 conversations in your chat list, though. Don’t worry; old messages are still saved! You can find them again by creating a new conversation with the same people or by searching for them. How do I find an old message or attachment? For iOS and Android only, you can find an old message if you tap to search for it using a keyword. If you saved your message, tap the More tab and then Saved and you can view it there with all of your other saved messages. How do I send an image to someone? Just click on the photo icon in your compose box to take a photo or to access your photo library. How do I follow a channel? The best way to follow a channel is to "favorite" it. That way, it stays visible in your team list. Tap the Teams button, then the team name. Select the next to the channel you want to favorite! How do I keep up with what's happening in channels? Staying up to date is easy. Tap the Teams button, then Recent. You’ll get all the latest news from your favorite channels. How do I know a channel is active? A bold channel is an active channel that has unread messages. Only channels you favorite will be visible from your team list. If a channel shows a number, that shows you how many times you’ve been @mentioned. You'll also receive notifications when someone @mentions you or replies to a conversation you're in, so that's another way you'll know a channel is active. 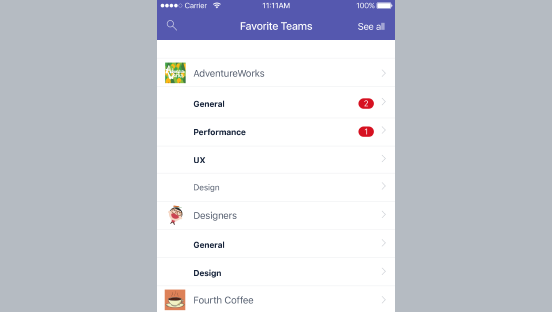 Here’s another way to stay up-to-date: Navigate to Recent after tapping your Teams button. That way, you’ll get all the latest news from your favorite channels. To find out which conversations include you, check out your Alerts. There, you can view all your @mentions and notifications. Just tap on a notification to go directly to that point in the conversation! The best way to make sure someone on your team sees your message is to @mention them! Just type @ before someone's name and they'll get a notification. 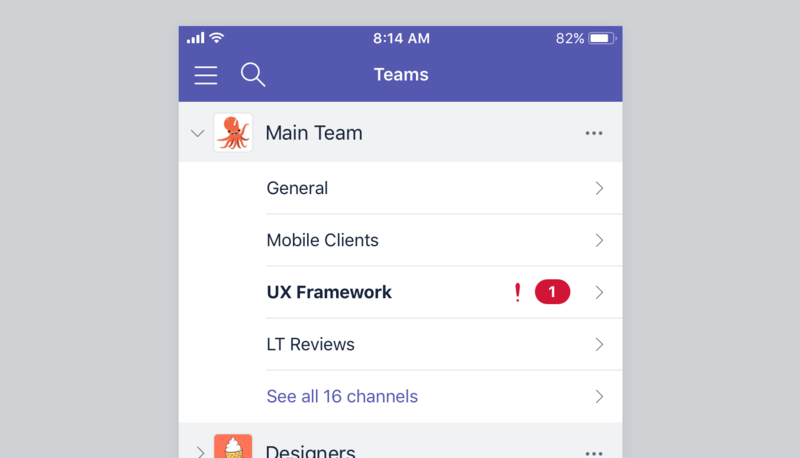 To get the attention of your entire team, just type @team before your message, and all your teammates will receive notifications. 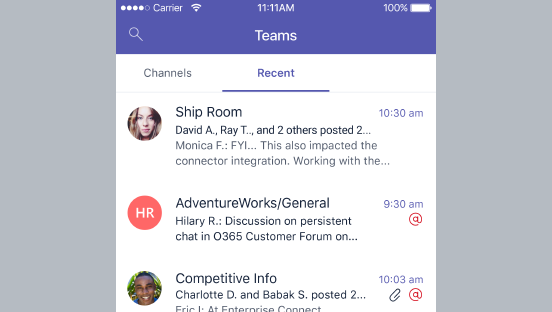 Typing @channel before your message also notifies all your team members about your message! Just FYI, @team and @channel mentions must be enabled by team owners! How do I remove someone from a conversation? There’s no way to remove someone from a conversation or group chat once they’re in it, but you can always start a new conversation with a different group of people! Why does a channel name sometimes appear bold? If a channel name appears bold, that means you’ve got unread messages. Why do channel names sometimes show a number count? If a channel shows a number, that shows you how many times you’ve been @mentioned. Can I change my notifications? For iOS and Android only, you can change your notification settings by tapping the More button. Once you're there, tap Settings, and then select Notifications. Staying up to date is easy. 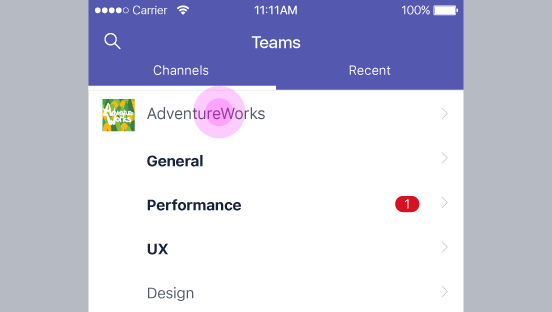 Tap the Teams button and then navigate to Recent. You’ll get all the latest news from your favorite channels. How do I stop or reduce the number notifications I get? To change your notification settings for Android, tap the More button. Once you're there, tap Settings, and then Notifications. To change your notification settings for iOS, tap the More button. Once you're there, tap , and then select Notifications. Will I be notified if someone is trying to get my attention? For Android and Windows Phone only, you’ll receive a notification if someone’s trying to get your attention. For things like @mentions, replies or likes, a red circle will appear next to the Activity button. We have connectors that let you integrate apps and services right into the conversation. You can see connector messages in the mobile app, but you can only add them in the desktop or web app. Can other people in Teams see my personal OneDrive and my OneDrive for Business? The OneDrive files you see in Teams are OneDrive for Business files associated with your Office 365 account—not your personal OneDrive. Only you and people you've explicitly given permissions to can see and modify these files. Can I see my OneDrive files? On Android, you can access but not upload your OneDrive for Business files. To do that, tap the More button, then Files, and then OneDrive.